A powerful unit capable of monitor and control all the basic elements of your grow. Automate temperature, humidity, air flow, lighting and irrigation and even create safety protocols & procedures. Get every variable under your direct control, enabling you to maximize your growth and efficiency. *Additional GroLab™ module, one GroNode is necessary to experience the full functionalities of PowerBot. *Each GroNode can control a max of 4 PowerBot’s. PowerBot allows you to connect and control the electrical peripherals of your growing environment. This powerful unit monitors and automates all the basic elements of your grow like temperature, humidity, air flow, lighting and irrigation. Create safety protocols & procedures to avoid overheating and minimize the damage in case of fire. With PowerBot every variable is under your direct control, enabling you to maximize your growth and efficiency! PowerBot provides power to all peripherals of your growing environment. It has 4 universal outlets that supports up to 2300W (per outlet and in total) or unlimited power when using an external electrical contactor. Automate any lighting system connected to PowerBot. With our advanced lightning system you are not bound to the 24 hours combined day, your grow(s) can now have a 20 hours of combined day/night, or even less if you wish so. The included temperature & humidity sensor and the capacity to independently control the electrical devices, allows you to perform a precise climate automation in your grow(s). 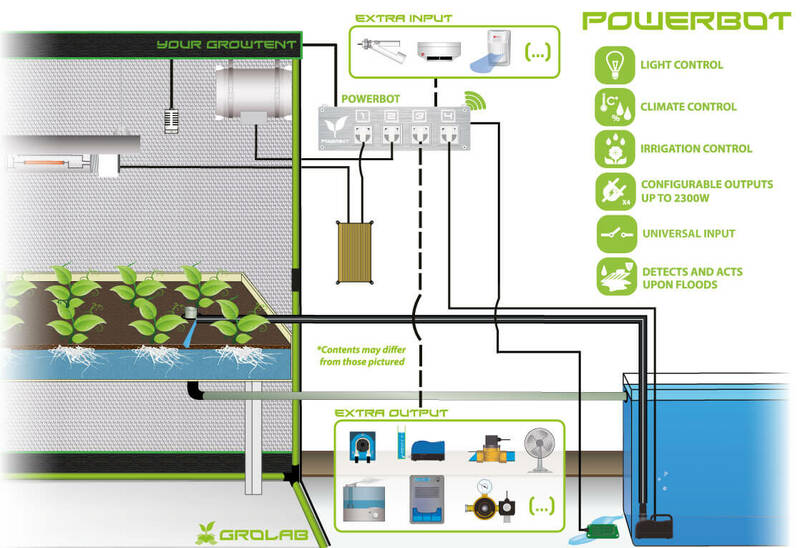 From drip systems to hydroponics, GroLab™ schedule capabilities allow you to pre set the irrigation for any kind of system. This module comes with 4 external switches that give the user the ability to manually control all connected peripherals at any time on the spot. Its design features 4 LEDs that indicates which elements are ON. Useful to visually understand what is happening on your grow(s). PowerBot allows you to create safety protocols & procedures to avoid risk situations or even react to them in order to minimize the damage. The cool-down feature prevents damage to devices that need some time to cool down before turning them on (HPS Lamps). PowerBot communicates with GroNode through radio frequency with a range of 25 meters indoors (depending on obstacles) and 100 meters in open spaces. This makes it easy to install the PowerBot on your growing area or even on the outside.